Horseweed (Conyza canadensis) is a dicot weed in the Asteraceae family. In Ontario this weed first evolved resistance to Group D/22 herbicides in 1993 and infests Peaches. Group D/22 herbicides are known as PSI Electron Diverter (Photosystem-I-electron diversion). Research has shown that these particular biotypes are resistant to paraquat and they may be cross-resistant to other Group D/22 herbicides. Rosettes of Conyza canadensis can be easily controlled by products containing glyphosate. Infestations of paraquat resistant Conyza canadensis are decreasing in Ontario because orchard growers have switched to glyphosate. A. Smisek, C. Doucet, M. Jones, and S. Weaver. 1998. 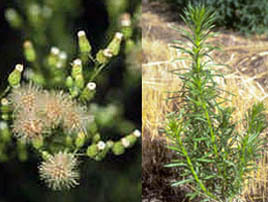 Paraquat resistance in horseweed (Conyza canadensis) and Virginia pepperweed (Lepidium virginicum) from Essex County, Ontario. Weed Sci. 46:200-204. Greenhouse, and Laboratory trials comparing a known susceptible Horseweed biotype with this Horseweed biotype have been used to confirm resistance. For further information on the tests conducted please contact the local weed scientists that provided this information. There is no record of differences in fitness or competitiveness of these resistant biotypes when compared to that of normal susceptible biotypes. If you have any information pertaining to the fitness of Group D/22 resistant Horseweed from Ontario please update the database. The Herbicide Resistance Action Committee, The Weed Science Society of America, and weed scientists in Ontario have been instrumental in providing you this information. Particular thanks is given to Susan Weaver for providing detailed information. Page, E., C. Granger, F. Tardif, I. Rajcan, M. Laforest, and R.E. Nurse. 2017. A chrono-geographical assessment of Canadian populations of Conyza canadensis. WSSA Proceedings 57 : 259 - . In the decade since the introduction of herbicide tolerant (HT) crops, an increasing number of weed species have been identified with resistance to the widely utilized herbicide, glyphosate. In the USA, there are now 14 weed species with confirmed resistance to the non-selective herbicides utilized in these systems. Similarly in Canada, there are 5 weed species that exhibit glyphosate resistance (GR); two of which were documented in the last year alone. Conyza canadensis has developed GR in both countries and its capacity for long-distance dispersal raises the potential of cross-border movement of herbicide resistant traits. The objective of this research was to examine the origins of GR C. canadensis populations from SW Ontario and explore their mechanism(s) of resistance. New and historic populations of C. canadensis collected throughout the counties comprising the most SW portion of the province of Ontario, as well as from bordering states of the USA. Eight microsatellite markers were used to characterize the relatedness of these populations and the target site gene for glyphosate (EPSPS2) was also sequenced. Dose-response studies were carried out to ascertain or confirm the resistance levels of the various populations. Results from the microsatellite and dose response studies indicate that the majority of Canadian GR populations are distinct from the American populations tested and exhibit notably higher resistance. Sequencing of EPSPS2 confirmed that, while GR in American populations is mediated by non-target site mechanisms, the predominate mechanism of resistance in Canadian populations of C. canadensis is target site mediated. These results represent the first report of target site mediate resistance to glyphosate in C. canadensis and clearly expose geographically distinct mechanisms of resistance to a given active ingredient on a regional scale within a single highly mobile species..
Conyza canadensis (CC) and Conyza bonariensis (CB) are troublesome weeds around the world. Extensive use of herbicides has led to the evolution of numerous Conyza spp. herbicide-resistant populations. Seeds of 91 CC and CB populations were collected across Israel. They were mostly found (86 %) in roadsides and urban habitats, two disturbed habitats that had been dramatically impacted by human activities, thus we classify these species as anthropogenic. Although pyrithiobac-sodium was only used in cotton fields, 90 % of Conyza spp. populations were identified as pyrithiobac-sodium resistant, suggesting possible natural resistance to pyrithiobac-sodium. CC21 and CC17 C. canadensis populations were highly resistant to all tested ALS inhibitors due to a substitution in the ALS gene from Trp574 to Leu. They were also atrazine resistant due to a substitution in the psbA gene from Ser264 to Gly. The high level of imazapyr and pyrithiobac-sodium resistance observed in the CC10 population was due to an Ala205 to Val substitution. However, high resistance to sulfometuron methyl and pyrithiobac-sodium in population CC6 was due to a point mutation at Pro197 to Ser. All resistant plants of CC21 population showed both psbA (Ser264 to Gly) and ALS (Trp574 to Leu) substitutions, leading us to the conclusion that the attempt to overcome resistance to one mode of action by overuse of another will most likely lead to multiple herbicide resistance. Furthermore, we concluded that only individuals that carry both mutations could survive the shift between the two modes of action and overcome the fitness cost associated with the PSII resistance..
Ford, L. ; Soltani, N. ; McFadden, A. ; Nurse, R. E. ; Robinson, D. E. ; Sikkema, P. H.. 2014. Control of Canada fleabane (Conyza canadensis) with glyphosate DMA/2,4-D choline applications in corn (Zea mays). Agricultural Sciences 5 : 77 - 83. Glyphosate resistant (GR) Canada fleabane (horseweed) has quickly spread across southwestern Ontario and is a difficult weed to control in GR crops. Glyphosate dimethylamine (DMA)/2,4-D choline (Enlist Duo®TM Dow AgroSciences LLC), a new herbicide premix developed by Dow Agro Sciences, provides control of GR and other problematic weeds. The objective of this study was to compare single and sequential applications of glyphosate DMA/2,4-D choline for the control of GR Canada fleabane in GR corn. Three single applications of glyphosate (DMA)/2,4-D choline (1720 g.ae.ha-1) were evaluated: (1) preplant (PP) applied to Canada fleabane up to 10 cm diameter/height, (2) postplant 1 (POST 1) applied when Canada fleabane was up to 20 cm tall and (3) postplant 2 (POST 2) applied up to 30 cm tall Canada fleabane. Four sequential applications were also examined:(1) PP followed by (fb) POST 1, (2) PP fb POST 2, (3) POST 1 fb POST 2 and (4) PP fb POST 1 fb POST 2. The single applications provided 69%-86% control of the GR Canada fleabane while the sequential applications increased control to 92%-100%. Three applications did not provide an increase in control over a sequential two-pass application at 8 weeks after the application (WAA). Results from this research indicate that a sequential 2-pass application of glyphosate DMA/2,4-D choline provided acceptable control of GR Canada fleabane in corn..
Pavlovic, D. ; Reinhardt, C. F. ; Bozic, D. ; Vrbnicanin, S.. 2013. Determination of Conyza canadensis levels of sensitivity to glyphosate trimesium sulphosate. International Journal of Agriculture and Biology 15 : 1091 - 1097. Changes in leaf anatomy were examined in two S. African populations of Conyza canadensis of which one was presumed to be resistant (CCPR) and the other susceptible (CCS) to glyphosate. Glyphosate was applied to plants, which were grown from seed collected from these populations, at rates of 1, 2 and 4 kg a.e. ha-1 of TOUCHDOWN® [active substance: glyphosate trimesium salt, 500 g L-1] that are equivalent to 2, 4 and 8 L ha-1 of the herbicide Touchdown. Leaf samples for the light microscope (LM) analysis were collected 3, 7 and 24 h after treatment (HAT). Changes in chlorophyll and shikimate content of leaf material were also examined. Changes in the palisade and pith tissue of leaves were not detected in the investigated populations at 3 and 7 HAT. However, at 24 HAT the different herbicide doses caused changes in leaf anatomy. These changes (injuries) were detected in the CCS at all tested doses, but in the CCPR population of C. canadensis the injuries were observed at only the two highest rates, 2 and 4 kg a.e. ha-1. Chlorophyll and shikimate contents indicated significant differences between the treated and untreated plants of susceptible population only. Difference in glyphosate resistance between the CCS and CCPR populations was confirmed with an index of resistance of 1.58. This value of the index of resistance indicates that CCS population is 1.58 times more susceptible to glyphosate compared to CCPR population..